Rex Whistler was an incredibly talented artist who has only recently received very much attention. Whether this lack of critical attention was because he was seen as a dilettante, able to turn his hand to murals, theatre design or book illustration, or because his inspiration came mainly from the past, particularly the 18th century, or because he died young, killed during WWII, is an interesting point. Maybe it was a combination of all these things. 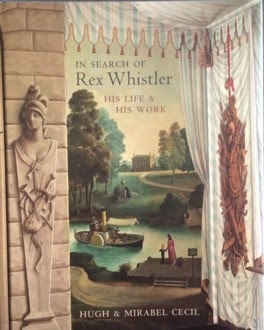 I bought this beautiful book about Rex Whistler on a whim &, since then, as often happens, Rex Whistler's name has been everywhere. I've found other books on the tbr shelves that relate to him & a new book about his friendship with the writer Edith Olivier, has just been published. Rex was born in 1905 & came from a middle class family. His talent for drawing was recognised early on & he attended the Slade art school. He seemed to draw all the time. He could draw while he was having a conversation (he once kept up a conversation with several fellow students while working on a mural), he illustrated his letters with little drawings & cartoons. He had an almost photographic memory & amazed his fellow students by looking intently at a model, then turning his back & making an exact drawing of what he'd seen. At the Slade, he became friends with Stephen Tennant, a young aristocrat who drew Rex into the circle of the Bright Young Things. Tennant was a very beautiful young man who was obsessed with his own beauty & with beautiful things. His mother, Pamela, had been one of the beautiful Wyndham sisters, & had married the politician Lord Grey in 1922. Rex was drawn into this world of beauty & wealth, centred around Pamela's home Wilsford Manor in Wiltshire. It was through Pamela & Stephen that Rex met Edith Olivier. Edith, a friend of Pamela's had been invited to join them on a trip to Rome as she was mourning the death of her sister. Edith & Rex hit it off immediately. Although she was nearly thirty years his senior, they had many things in common, especially a love of art & literature. The friendship was one of the most important in Rex's life & Edith's home, the Daye House, in Wiltshire, became a second home & a refuge to him. A new book by Anna Thomasson, A Curious Friendship, has just been published about Rex & Edith. There's a review here & the latest BBC History podcast features an interview with the author. Rex's career began with a commission to paint a mural at a boy's club at Shadwell in London's East End. His tutor, Henry Tonks, had got him the commission & he worked on the rural tavern scenes with a fellow student, Mary Adshead. More importantly, his next commission was for another set of murals, for the tea room at the Tate Gallery. These murals have recently been restored & can be seen in this article here. There's also a video about the restoration here. Whistler's style was inspired by 18th century art & there's also a lot of humour in his depictions of people & landscapes. He often included a self-portrait, maybe as a gardener, &, later, when he painted murals in country houses, he would include the family pets as well as references to the owner's interests. He used decorative effects such as trompe l'oeil, framing a scene in a proscenium arch as though it was on the stage, decorative curlicues & swags & the effect was magical. His most famous murals are at Plas Newydd (the house is now owned by the National Trust), the tent room at Port Lympne, (more pictures here) which is now a hotel, & several homes in London. Whistler's friendship with the Tennants & Edith Olivier drew him into artistic & theatrical circles. Cecil Beaton & William Walton were just two of the friends he made & this led to commissions for book illustration & theatre design, at which he excelled. He was very practical about his work & took endless pains to realise the vision of the director of a play, learning an immense amount about theatre craft in the process. His love affairs were tortuous & usually ended badly. He always fell in love with women who couldn't return his love with the intensity that he needed & could never love the women who fell in love with him. His letters to Edith are often full of the latest romantic tragedy. When WWII began, Rex decided to join the Army, as he felt he couldn't sit back & allow others to fight the war for him. He could have been commissioned as a war artist (although there is evidence that the Advisory Committee had dismissed him as a lightweight, merely listing him as a book illustrator) but he decided that he wanted to serve as a regular soldier. 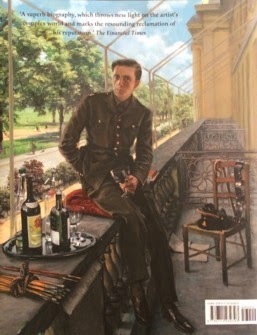 He became a tank commander in the Welsh Guards (the painting above shows him on the day his uniform arrived) &, although the army wasn't the most congenial way of life, Rex worked hard & endeared himself to the men in his command. He was a sympathetic officer, his men trusted him & his artistic talents also came in handy. It was during the war that he turned to portraiture in a more serious way. His murals & illustrations had always been full of figures but now he began painting portraits of his fellow officers, the self-portrait above & this beautiful portrait of Edith from 1940. I think my favourite is this portrait of Edith lying on a daybed at Daye House in 1942. There are about 40 of Rex's paintings here on the BBC Your Paintings website. Rex was killed in Normandy in July 1944, aged only 39. Hugh and Mirabel Cecil have written a sympathetic & affectionate biography of a man who was immensely talented as an artist but also as a friend & companion. His letters are just as witty as his drawings & murals. He was never really taken seriously as an artist in his lifetime but I'm not sure that he was bothered by that. There was very little of the tortured artist in Rex, he saved those feelings for his unsatisfactory love affairs. He seemed to be moving in a new direction in his art when he was killed, maybe a more serious direction, especially in his portraits, but an added seriousness would be only natural during wartime. He may have given up on the 18th century curlicues in favour of something more modern. I can also recommend the book itself, which is one of the most beautifully produced books I've seen in a very long time, with illustrations & photographs on every page. This is definitely not a book to read on a Kindle! Rex's brother, Lawrence, worked hard to establish his reputation in the years after his death, writing a biography of his brother & producing a catalogue of his work. Lawrence was also an artist & created this beautiful memorial to his brother in glass at Salisbury Cathedral. I remember seeing the memorial when I visited the cathedral many years ago, before I'd ever heard of Rex Whistler. Now, I need to go on & read Anna Thomasson's book & Edith's diaries which have been on the tbr shelves for several years, just waiting for the moment when I would need to read them. I have a feeling that Edith is going to be even more interesting & sympathetic from the glimpses I've had of her so far. I've spent the last week absorbed in reading about Vera Brittain & yesterday, on Anzac Day, I saw the new film of Testament of Youth. 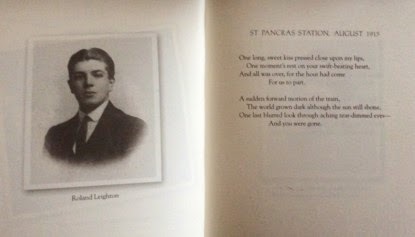 As scenes of parting at railway stations seem to be central to so many stories of WWI, here is a poem Vera wrote after saying goodbye to Roland. I can't resist adding one of Roland's poems as well. I've always loved this one, with its wistful poignancy. He was killed just a month later, just before Christmas 1915. I've always been interested in how the literary canon is decided upon. Who makes the decisions & which authors are left out & why? As a lover of mystery & detective fiction, this is an area that particularly interests me. 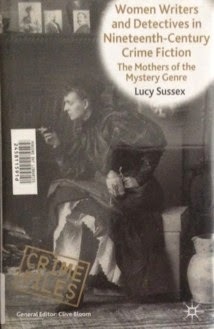 Having read Lucy Sussex's earlier work on Ellen Davitt & Mary Helena Fortune (two Australian women crime writers featured in this book), I'd had my eye on this book for some time. It's part of Palgrave Macmillan's Crime Files academic series & quite pricey so I borrowed it on Inter Library Loan & I'm very glad I did. Don't be put off by the academic tag. This is an immensely readable survey of early women crime writers & it made me want to immediately get hold of more of their work. Sussex begins with a look at early crime fiction, the Newgate novels about criminals, the role of newspapers in retelling the stories of crimes as they happened - the report of the crime itself, the investigations, then the trial & the outcome. The Gothic novels of Ann Radcliffe introduced elements of crime & mystery as did novels of the 1830s such as Eugene Aram by Bulwer Lytton & Jack Sheppard by William Ainsworth. Edgar Allan Poe's stories featuring Chevalier Dupin were published in the 1840s & are often seen as the beginning of crime fiction but already Sussex has demonstrated that the genre stretches much further back. I particularly enjoyed reading about the lives of the women writers featured in the book. I knew Catherine Crowe as a writer of ghost stories- her book The Night Side of Nature is a classic account of psychic phenomena. However, I didn't know about her crime novels, The Adventures of Susan Hopley; or Circumstantial Evidence & Men and Women. Susan Hopley was published in 1841, the same year as Poe's The Murders in the Rue Morgue. Its success is shown by the fact that it was soon parodied & a stage version was produced. Crowe's novels use female amateur detectives & complex plots. Her life was as fascinating as her books. She was an eccentric women, who wrote novels, stories & plays, held literary salons & was pilloried for her interest in the supernatural. She had a nervous breakdown which led to her wandering naked in the streets of Edinburgh one night. This incident led to her becoming a figure of fun in the literary world, even though she soon recovered from her illness. Other authors are better known. The work of Mary Elizabeth Braddon has had quite a resurgence in recent years. She was one of the most prominent authors of Sensation fiction & often compared favourably with Wilkie Collins. Her private life, like Collins's, was unconventional. She lived with her married publisher, John Maxwell, for years as he couldn't divorce his wife. She looked after his six children & she had six of her own, while writing & publishing a phenomenal amount of fiction. Many of her novels had elements of crime, especially in later years when the enthusiasm for sensation had waned. Ellen (Mrs Henry) Wood is best known today for her bestselling Sensation novel, East Lynne. Her private life couldn't be more different to Braddon's. Very little is known apart from a hagiographic memoir written by her son after her death which portrays her as an eminently respectable wife & mother. Ellen Wood wrote many novels of varying quality & this may be one reason why she & Braddon are not as respected as their male contemporaries. The most interesting chapter of the book was about two Australian authors, Ellen Davitt & Mary Helena Fortune. Davitt wrote the first mystery novel published in Australia - Force and Fraud (1865) - & Fortune, the longest running crime serial. Lucy Sussex has brought these two women out of the shadows with her extensive research into their lives & work. She continued the research of John Kinmont Moir, who investigated Fortune in the 1950s when there were still people alive who remembered her. Fortune's long career involved writing serials for newspapers, badly paid work that often left her nearly homeless. She knew about the law from both sides - her second husband was a mounted police trooper & her son, George, spent over 20 years in prison& had a lengthy criminal record. Sussex has edited the work of both women & I remember reading it when it was published in the 1980s. Ellen Davitt has been commemorated in the awards for women's crime fiction awarded each year by Sisters in Crime Australia. The American writer, Anna Katherine Green, is often called the mother of the detective novel. Her bestseller, The Leavenworth Case, was published in 1878 so, having read this book, it's easy to see that there were many women who came before Green. She was still an important writer as she wrote several detective series, two of them featuring women detectives. Another American writer, Metta Victor, published her detective fiction under the androgynous pseudonym Seeley Register. She wrote across many genres, including household advice & anti-slavery polemics. Her detective novel, The Dead Letter, is still in print & has been regarded as technically innovative & tightly plotted. I wanted to read almost every novel Sussex discussed. I have quite a few of them, especially Mary Elizabeth Braddon's & I've downloaded several free ebooks. More have been added to wishlists. I can recommend this book to anyone interested in the development of the crime novel & especially the contribution of women writers, many of them unjustly forgotten until recently. Lucy Sussex has a new book about to be published which I'm also looking forward to reading. Called Blockbuster!, it's the story of another Australian crime fiction phenomenon, Fergus Hume's The Mystery of a Hansom Cab. The new movie based on Vera Brittain's autobiography Testament of Youth is just about to be released in Australia. Testament of Youth is one of my favourite books & I've already posted about it here so there's not much chance that I won't go along to see the movie (you can see the trailer here). 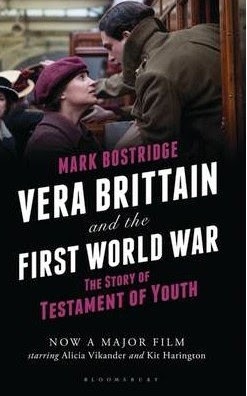 Mark Bostridge co-wrote a biography of Vera with Paul Berry, her literary executor & he was a consultant on the new film. 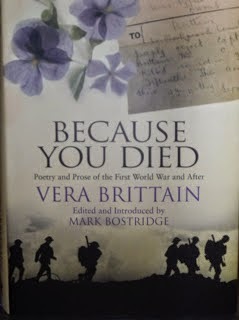 This book, which combines biography with the story of how Testament of Youth was written & the afterlife of the book as television series, ballet & now film, is a useful introduction to Vera Brittain's life. I have to say that this book is probably most useful to someone who sees the movie & wants to know a little more about Vera's life. Having read everything I can get my hands on by & about Vera since reading Testament of Youth in the late 70s, there wasn't anything very new here. 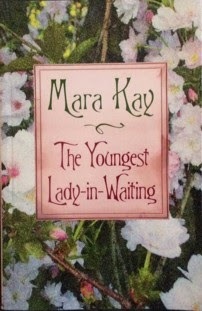 The first chapters tell the story of Vera's life as a provincial young lady in Buxton, her struggle to be allowed to study at Oxford, her close relationship with her brother, Edward & her meeting with Roland Leighton, the young man she fell in love with & who was killed just before Christmas 1915. Vera had decided to postpone her studies to become a Voluntary Aid Detachment nurse & worked in hospitals in London, Malta & France. After the war, when she had lost everyone who was closest to her, Vera returned to Oxford, meeting Winifred Holtby, who became her closest friend, & becoming a writer & lecturer, living in London. Vera married George Catlin in 1925 & had two children, but her wartime experiences never ceased to occupy her thoughts & she tried many different ways of telling her story. War memoirs weren't wanted in the immediate aftermath of the war & it wasn't until the late 1920s that people wanted to read about the war. Vera had tried to reimagine her experiences as fiction; she tried to have her wartime diary published but finally she decided to write a memoir of her life which would take in more than just the war years. Testament of Youth covers 1900-1925, Vera's childhood in Buxton, her desire to study & the years after 1918 when Vera tried to make a new life for herself after the shattering experiences & losses of the war. At the core of the book, however, are those four years of the war & the very personal story she tells of her love for Roland, her friendships with two other men, Victor Richardson & Geoffrey Thurlow, her love for her brother, Edward, & her own war service as a nurse. As well as telling her own story, Vera wrote the book as a tribute to the men she lost & also to emphasize the fact that women & women's work played a vital part in the war effort. Testament of Youth was one of the first books to explore women's experiences of the war. It may not have been the first book to do so but it was certainly the most successful. The success of Testament of Youth changed Vera's life. I enjoyed reading about the way Vera went about writing the book, because I love reading about how writers work, the changes she made to her feelings & responses to events as shown in her diaries & letters of the time & the way she shaped the narrative. The most interesting section of this book was the description of how Testament of Youth was rediscovered in the 1970s (unfortunately after Vera's death) by Virago which led to the wonderful TV series with Cheryl Campbell. 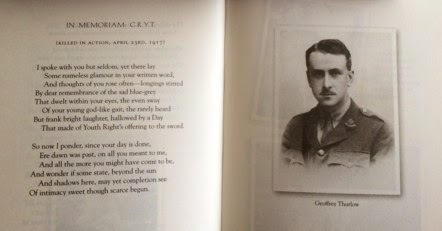 The feminist movement was instrumental in rediscovering books like Testament of Youth that described the experiences of women in a conflict dominated by the war memoirs & poetry of men - Wilfred Owen, Siegfried Sassoon & Robert Graves. I didn't know that a ballet, Gloria, by Kenneth MacMillan, had been based on the book. The production of the new movie is described with Bostridge's personal experiences of being on the set. There's also a chapter taken from Lives For Sale, a book about the experiences of biographers edited by Bostridge that explores in more depth the death of Edward Brittain & how Bostridge wrote his biography in collaboration with Paul Berry. Lives For Sale, by the way, is an excellent book about the writing of biography with chapters by Antonia Fraser, Hermione Lee, Lyndall Gordon, Margaret Forster & Claire Tomalin among many others. Bostridge also includes a Gazetteer of the places associated with Vera's life & there are many photos included throughout the text as well as colour plates from the new film. So, I would have to say that this book is really only for the Vera Brittain completist (like me) or for someone who sees the film & wants to explore Vera's life a little more. I'd be more inclined to say, read Testament of Youth, I'm sure I'll be rereading it after seeing the new movie but if 600+pp is a little daunting, this book does concentrate on the period of the film. On a bit of a tangent, I came across this wonderful blog, A Bluestocking Knits, where I read this fascinating post on the accuracy or otherwise of the knitwear in the new film. There's also a link to this article in Harper's Bazaar on the costumes, including some gorgeous hats. (Have a look at the Bluestocking's post on the TV series Outlander as well - haven't seen the series but loved the first four books before I lost interest). I'm sure I'll be nitpicking about any changes to the book in the screenplay but the clothes look fabulous. Next Saturday is Anzac Day & I've been reading about Vera Brittain this week so I thought I would post one of the poems she wrote during the Great War. They were published as Verses of a V.A.D. in 1918 & the subjects range from her war service in London, Malta & France to laments for the young men she lost. This poem was written in response to the death of Geoffrey Thurlow, one of the four men Vera knew well who were killed. It's taken from Because You Died : Poetry and prose of the First World War and after. edited by Mark Bostridge. That made of Youth right's offering to the sword. Of intimacy sweet though scarce begun. I thought I'd highlight a few bookish links & some news about one of my favourite series. The British Library Crime Classics have been one of the publishing successes of the last couple of years. I love them. I've always enjoyed Golden Age mysteries & these books are so beautifully produced & attractively presented. It's a real treat to be discovering new authors from this period. After all, what do we do when we've read all of Christie, Sayers, Tey, Marsh & Allingham? 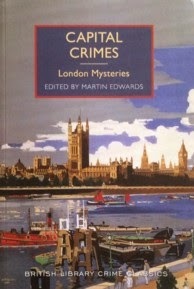 I've bought nearly all of the Crime Classics & have reviewed several of them here, here & here. Martin Edwards has become the consultant for the series which means that future titles will be interesting, sometimes surprising & always well worth reprinting. I've just started reading Capital Crimes, a collection of short stories set in London & I was very excited to read on Martin's blog that there are another half dozen books in the series to be published before the end of the year. The British Library also have another series of Spy Classics which I haven't investigated as yet. The latest edition of Shiny New Books is available to read here. I've just finished reading a gorgeous book about the artists Rex Whistler so I was very interested to read the review of A Curious Friendship by Anna Thomasson, about the friendship between Whistler & Edith Olivier. There's also an article by Anna Thomasson about her research for the book, which I always find fascinating. I was also interested to read Desperate Reader's review of George Gissing's The Whirlpool, just reprinted by Penguin. I love Gissing & I've only read a couple of his books. There are lots of other reviews & interviews, including a review of Capital Crimes & an interview with Robert Davies, the publisher of the British Library Crime Classics. There's another interview with Davies here, on a blog I've just discovered, Past Offences. & The Youngest Lady In Waiting arrived yesterday! I've been dipping in & reading bits & pieces & I can't believe it's 35 years since I last read it, it's all so familiar. I have a feeling I'll be dropping everything to read this next. Bill Bryson is one of the funniest writers in the world. I know that's quite a bold statement but he makes me laugh so I'm prepared to go out on a limb. One of my favourite Bryson books was Notes from a Small Island, about the UK. Well, after many years & a diversion into books on science & his childhood, Bill Bryson has written another travel book about Britain, The Road to Little Dribbling which will be published later this year. If I'd been keeping up with reading The Bookseller at work, I'd have known about this weeks ago. I'd also have known that Bryson has sold 8,648,774 books in the UK (exactly). As it is, I read about it on Elaine's blog & this article in The Guardian. Also in The Guardian was an article celebrating the 200th anniversary of Anthony Trollope's birth. Writers nominated their favourite Trollope novel. I'm currently rereading Miss Mackenzie with my 19th century book group & I started reading Cousin Henry at the weekend after reading about it here as it was the only Trollope in the list I hadn't yet read. Books and Chocolate is celebrating Trollope's anniversary with giveaways & reviews here. Has anyone read The Tale of Genji by Murasaki Shikibu? I enjoyed reading about Japanese history so much in Judith Gautier's The Usurper that I've just ordered this lovely Penguin Deluxe edition on a whim. All 1,216 pages of it... I could have dipped my toe in with the abridged edition but I couldn't resist a Penguin Deluxe. However, I feel completely justified in buying yet another book because I've read this article where Umberto Eco tells us why unread books are more valuable in our lives than read ones. Thank you Rose for sending me the link. Eco calls these books the antilibrary & describes them as the repository of all the knowledge that we don't yet have. So buying a huge novel about 11th century Japan is completely justified because I know absolutely nothing about the subject. This theory may not justify the purchase of my 100th book about Richard III (The Bones of a King by the Greyfriars Research Team, ordered this week) or the 3rd or 4th copy of a favourite book because I love the cover (Testament of Youth, Cold Comfort Farm, The Return of the Soldier...) or it's a Folio Society edition (Possession, Lord Peter Wimsey novels, The Daughter of Time, Excellent Women), but it justifies a lot of my other book buying decisions & I'm adopting it immediately! I love books about houses. Novels about someone buying a house in the country, renovating it, finding the right furniture, creating a home, creating a garden, I love reading about that. I can't stand reality TV shows about renovation though but maybe that's just because I'd rather read than watch TV. 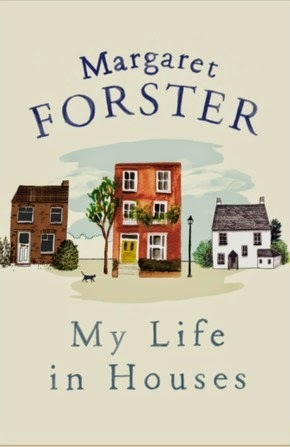 I'm also a fan of Margaret Forster's books so I was looking forward to reading her new memoir, My Life in Houses. The book is structured in a series of chapters about the houses Forster has lived in. She was born in 1938, in Carlisle, in a house on the Raffles Council estate. This house represented a step up for her parents & they were proud of the hard work they'd done to get the house & then to maintain it. Margaret, however, was always looking at other houses, always slightly ashamed of living on a Council estate, especially as the Raffles estate had quite a bad reputation by the early 1950s. She spent as much time as possible in other people's houses, looking longingly at the Edwardian villas on Norfolk Road, wanting what she didn't have - a room of her own, mainly. She was a clever student & felt she deserved a proper study or at least a desk in her bedroom. The only time she ever really felt at home as a teenager was when she was alone in the house. Margaret passed the entrance exam & went up to Somerville College, Oxford. She thought that living in college would be the culmination of her ambitions but she hated it. The noise, the other people so close by. Her furniture & belongings looked ridiculous in the spacious corner room. She soon moved into lodgings with a friend. The landlady, Mrs Brown & her sister, Fanny, who did all the work, were an odd pair but Margaret loved the house, imagining the many other women who had lived in her room over the years. After Oxford, Margaret married the writer & journalist Hunter Davies. They lived in Hampstead, in a beautiful house owned by Mr Elton, an eccentric man who hated noise. Eventually, reluctantly, they had to move because they wanted to start a family. The house they finally bought, in Boscastle Road N W 5, was to be home for over 40 years. There were interludes in Portugal, when the children were small, & weekend cottages in the Lake District but it was Boscastle Road & eventually another house in the Lakes, in Caldbeck, that became the homes Margaret had always wanted. The stories of the renovations at Boscastle Road show how much work is needed when your home is a Victorian wreck that Margaret hadn't wanted to live in anyway. Gradually the house grew on them. The plan to move back to Hampstead as soon as they could afford it faded away & the Boscastle Road house became home. Even the trial of having a sitting tenant, Mrs Hall, wasn't enough to deter the Davies' from loving the house. They just had to come up with a way of moving Mrs Hall. This book isn't just a series of stories about house hunting & the benefits of one district of London over another. It's really about what makes a house a home & the way that ideas about home have changed. One of the most moving themes is about the home as a haven. Margaret Forster had breast cancer twice in the 1970s & she describes so beautifully how she felt when she finally went home from hospital after the first lot of treatment. Arriving home was in itself a healing process. Once I was inside my house the relief washed over me like a tide going out - I was on dry land again, secure within its familiar walls. And that's how the house changed its significance for me. It took on a magical quality. If I stayed in my house, I'd be safe. I knew perfectly well that this was fanciful nonsense, but it was how I felt. Sometimes, in the weeks that followed, I'd be out on the Heath enjoying a walk when I'd be overwhelmed with an urgent need to be inside my house. I'd start walking more quickly, then almost run, and when I reached our front door my hand would fumble with the key in my haste to get into the house. Once inside, I'd stand for a moment with my back against the door, and the ordinary sight of the staircase ahead of me, a toy dropped halfway up, a basket of clean clothes lying on the bottom stair waiting to be taken up - all this would calm me. I was fine again, cocooned by the familiarity of the house. One of my favourite Forster novels, Is There Anything You Want?, follows the lives of the women who attend a cancer clinic. I listened to it on audio, read by Susan Jameson, & found it very moving. I had no idea, then, that Forster had suffered from cancer. Only a few years later, the cancer returned, necessitating another mastectomy & this time, chemotherapy.The cottage in Caldbeck near Windermere was the healing place this time, a place where Margaret & her family would spend half the year rather than just the odd weekend. This cottage had been built to withstand the full force of the wild winds coming from the west and so it was dug low into the ground. There were only two small windows - one in the living room one in the bedroom. Not much could be seen from them but views were not the point: keeping the wind and cold out was more important. That first night, there was a tremendous wind, howling and roaring all around, but the cottage stood firm, not a rattle to be heard. It hunkered down, just as it had done for two hundred years, and being inside it felt secure and safe. I read a review of this book that complained about the detached way that Forster writes about her life. I didn't find her writing to be detached at all. She seems very clear-eyed about herself, even brutally honest about her snobbery as a child & the way she looked down on her childhood home, taking for granted her good fortune. I was very moved by the later sections of the book where she writes about her cancer treatment & the effect that it has had on her. Her writing is restrained, matter of fact, unsentimental. She's more sentimental about houses than about her health. Several times she describes her anguish at leaving a loved home but other setbacks that might seem more personal are described dispassionately. I also enjoyed her thoughts on the importance of houses to the women she has written biographies of - Casa Guidi to Elizabeth Barrett Browning & Menabilly to Daphne Du Maurier. Margaret Forster has used the idea of home to structure this story about her life & the houses she's lived in & I found it an enjoyable, moving book. One final poem from the anthology I've been reading during Lent. 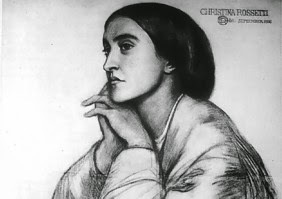 Christina Rossetti is one of my favourite poets & this lovely poem is one of her most optimistic & joyful. Rossetti lived such a quiet life in many ways. I remember reading her letters over several years as they were published & I thought they were fascinating even though they were often just short notes about a charity she was involved in or an enquiry after a friend. There was very little about her poetry but I loved their quiet domesticity as she cared for several elderly aunts & her mother in their last years. I'm not a fan of contemporary true crime, much too gruesome, but I do enjoy reading about historical mysteries. This book, The Anatomy of Murder, is one of a series of books originally published in the 1930s that have been recently reprinted. The authors, all well-known detective novelists in their time, were also members of the Detection Club, an institution still in existence today. The Detection Club's archivist, Martin Edwards, is a distinguished detective novelist & has written the Introduction to this book. Martin has also written a history of the Detection Club, The Golden Age of Murder, which is published next month. The Anatomy of Murder explores seven murder mysteries from the Victorian period to the 1930s. There are well-known stories such as the murder of three year old Francis Saville Kent at Road Hill House (recently the subject of The Suspicions of Mr Whicher by Kate Summerscale) (by John Rhode), the case of Adelaide Bartlett who was accused of poisoning her husband Edwin with chloroform (by Margaret Cole) & the murder of Julia Wallace (by Dorothy L Sayers).Then there's one that solved a bit of a puzzle for me. I'd always wondered who the Landru in the publisher's name Crippen & Landru was. Now I know. He was a Frenchman who, in the early 20th century, murdered at least a dozen women, leaving no trace of their existence. He chose his victims carefully, single women or widows with no family. He met them through the personal ads, looking to buy furniture, took them to his secluded country house & there, murdered them. How he disposed of the bodies isn't definitely known but these women were there one day & gone the next. It's a chilling story of a man with no remorse for what he had done. He never admitted his crimes & stayed calm throughout a lengthy investigation & trial. The cases aren't confined to Europe. The first story, by Helen Simpson, is set in Australia in 1865. The story of Henry Kinder is a tale of a love triangle. Kinder was a heavy drinker & his death was first thought to be suicide. However, his wife's lover, Louis Bertrand, started making wild statements about the case & was eventually charged with Kinder's murder. Another case, in New Zealand, is the final story in the book. Freeman Wills Croft tells the story of the double murder of a sheep farmer, Samuel Lakey & his wife, Christobel. Christobel was found drowned in the dam on their property but this was obviously no accident. There was a wound on her face as though she had been knocked out & her body was found face down in the water, covered with sacks. The first idea was that Samuel had murdered his wife & fled, as he was nowhere to be found. However, through brilliant detective work & careful forensic examination of the crime scene, it became apparent that Samuel too had been murdered. The murderer's plan was clever but, as is often the case, just a few mistakes set the police on the right path. Proving it was the difficulty when physical evidence of Samuel's death was elusive. My favourite chapter was on the murder of Julia Wallace, a case that, even today, is a cause of controversy. Just a couple of years ago, P D James came up with a new theory in the case (I haven't been able to read her article as it's behind a paywall but the main points of her theory are here). William Herbert Wallace was tried for the murder of his wife, Julia, in 1931. The case is baffling because, as Sayers writes, every fact can be interpreted in at least two ways. Wallace seemed to have no motive for the killing & his alibi was unusual. He was an insurance salesman & said that he had received a telephone message asking him to go to an address the next evening to meet a man about an insurance policy. The man & the address turned out to be fictitious but while Wallace was roaming around looking for this address, his wife, Julia, was battered to death in their home. Had Wallace himself made the phone call to establish an alibi or, had the murderer made the call to get Wallace out of the way? Dorothy L Sayers looked at the case as a detective novelist & assessed the facts as if the story were a novel. The business with the phone call & the alibi is very like fiction but it was fact. The dilemma was in interpreting the facts. Wallace's behaviour - calling attention to himself repeatedly on the tram journey to the fictitious address, making sure his neighbours were with him when the body was discovered - could be interpreted as guilty or innocent. Witnesses who could have proved that Julia was alive after Wallace left the house were dismissed as mistaken or unreliable. If this had been a novel, Sayers or James would have been able to come down on one side or the other according to their plan but, in real life, it wasn't so easy. Wallace was acquitted but many people still believe him guilty & if he was innocent, the real murderer got away with his crime. However, if it was the women of England who hanged Mrs Thompson, against all reason and all justice, then it was equally due to the women of England that Mrs Rattenbury was saved from the gallows; for if Mrs Thompson had not been hanged, Mrs Rattenbury surely would have been. Alma Rattenbury's life was ruined by the trial & the publicity & she committed suicide shortly afterwards. Although there was really no mystery about the murder itself, as George Stoner wasn't clever enough to even try to hide his guilt, it was a landmark case in that the personal life of the people involved was excluded from deliberations of the Court. The judge in the Rattenbury trial was determined not to make the same mistakes as his colleague had in the Thompson case. No matter what the judge, lawyers or jury may have thought of the morals of the accused, they didn't allow it to influence their decision. A new anthology of true crime writing by members of the Crime Writers' Association, Truly Criminal, is about to be published. It includes essays by Catherine Aird, Peter Lovesey & a newly discovered essay on the Wallace case by Margery Allingham. I'm looking forward to reading it. I mentioned the Penguin Monarchs series a little while ago & I've now read one of them - John Guy's biography of Henry VIII, subtitled The quest for fame. The books themselves are lovely. Small, pocket-sized hardbacks; white boards with a paper wrap around half-size jacket. Guy is a well-known writer & historian of the Tudor period. I enjoyed his biographies of Mary, Queen of Scots, My Heart Is My Own, & his last book, The Children of Henry VIII, so I was looking forward to this book. I was also interested in how he would write a biography of such a larger than life figure as Henry in just 100pp. Actually, I think that's going to be a challenge for most of the authors in this series. Henry was never meant to be king. He was brought up in his mother's household & was very close to her. A fascinating manuscript illustration was discovered only a few years ago which may show young Henry weeping for his mother's death. Henry's father, Henry VII, famously usurped the throne by defeating the last Yorkist king, Richard III, at Bosworth in 1485 & his marriage to Elizabeth of York was meant to bring together the two warring factions. The Tudor kings may have spent the next fifty years pursuing the last Yorkist claimants but, by & large, their reigns were peaceful. Rather than foreign invasions, the desire for a male heir to continue the dynasty would become a focus of the reign of every Tudor monarch. Henry VII's eldest son, Arthur, died at the age of just 15 which meant that young Henry, his father's only surviving son, became the heir. Henry VII's grief at the death of Elizabeth of York in 1503, just a year after Arthur's death, changed his character. His health declined, he became suspicious & almost paranoid in his desire to protect Henry from any evil influences. When his father died in 1509, Henry was just eighteen & he was determined from the first to make his mark in European politics. He had a full treasury & a boundless belief in his own ideas. He was determined to go his own way & attempted to do this by marrying his brother's widow, Katherine of Aragon, in an attempt to forge an alliance with her father, Ferdinand of Spain. He tried, at various times, to ally himself with Francis I of France, Ferdinand's successor, Charles V & the various Popes in Rome. He tried to annex Scotland, whether through conquest in war against his nephew, James V, or through marriage alliance through the proposed marriage of his son, Edward with the baby Mary, Queen of Scots in the 1540s. None of his foreign wars were very successful & his loving, respectful relationship with the Papacy came to an end when he wanted to divorce Katherine & marry Anne Boleyn in his desperate search for a male heir. John Guy is very good at elucidating Henry's character. Henry was eager to impress those he respected & admired, from Archduke Philip, who was shipwrecked in England in 1506 & dazzled the teenage Henry with his abilities as a jouster & all-round sportsman to Francis I & Pope Julius II. Henry also showed a remarkable ability to believe whatever was most convenient for himself, from choosing the passages in the Bible that supported his contention that his marriage to Katherine was invalid (while ignoring others that said the opposite) to his refusal to see those he had dismissed from his favour, from his wives to his most trusted courtiers & servants. Once they had disappointed or betrayed him, he never saw them again. It was as if he had deleted them from his memory, out of sight, out of mind. It was on to the next wife who would surely give him the son he craved, or the next minister who would carry out his grand plans. He is at his worst in the mid 1530s when he persecuted Thomas More, Bishop Fisher & the Carthusian monks for their refusal to accept the break with Rome. I also enjoyed Guy's discussion of the way that Henry created his own image through his acquisitions of art & property. He became enormously wealthy through the Dissolution of the Monasteries, part of his break with Rome & the establishment of a new Church of England with Henry himself as the head. He commissioned tapestries woven with gold thread depicting the stories of King David (he loved the story of David so much that he eventually had nine sets of tapestries depicting the story) & Solomon. The quality of the work rivalled anything owned by the Pope. He patronised Hans Holbein, who produced a new style of portraiture at Henry's Court. Holbein's image of the king, standing full square & staring us straight in the eye, is still the image most of us see when we think of Henry. Henry's last years were dominated by his own ill health, both physical & mental. He never recovered from a fall from his horse in the early 1530s which resulted in an ulcer on his leg that refused to heal. His paranoia grew as he aged & his temper grew more uncertain. His last wife, Katherine Parr, narrowly escaped arrest when she disputed religion with Henry. He was about to have her arrested for heretical views, encouraged by the conservative elements at Court. Fortunately she was warned in time & convinced Henry that she had only wanted to divert his mind from the pain of his leg with her arguments & that she would, of course, be guided by him in everything. It's hard to be sure whether Henry was serious about arresting Katherine or was he just trying to frighten her into obedience? It must have been a terrifying experience to be at Henry's Court in those final years. 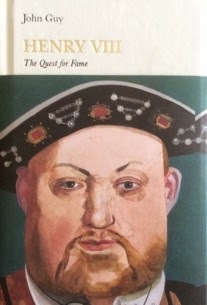 Henry VIII : the quest for fame is an excellent introduction to Henry's life. There's also a lot to enjoy if you've read other biographies of Henry as John Guy brings a new perspective to his portrait of the most famous monarch in England's history. 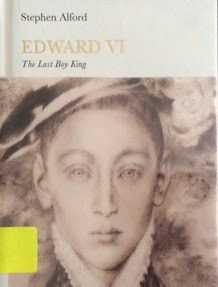 Next up is Stephen Alford's biography of Henry's son, Edward VI. Just as it's a difficult task to write a short biography of a king like Henry VIII, it will be interesting to see what Alford does with a boy who became king at the age of nine & was dead at sixteen. 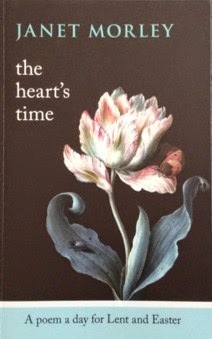 On Easter Sunday, I thought I'd post one of the poems from Janet Morley's anthology, The Heart's Time. Many of the poems in the book are unfamiliar to me but this one, by George Herbert, is one of my favourites. It's a very gentle, conversational poem but speaks of any loving relationship, not just the relationship between the speaker & God. In the Foreword of this book, written in May, 1941, novelist Margaret Kennedy looks back over the last year. A year ago today the French line was broken near Mézières. From that day until the end of the first phase of the Battle of Britain, in October, we in this country were living through a supreme experience: supreme in the collective life which is our history and supreme in our individual lives. Many of us were more frightened than we had ever expected to be. Many, before the year was out, found themselves being braver than they had ever expected to be.. We discovered unsuspected passions and loyalties. We realised which things we valued most. 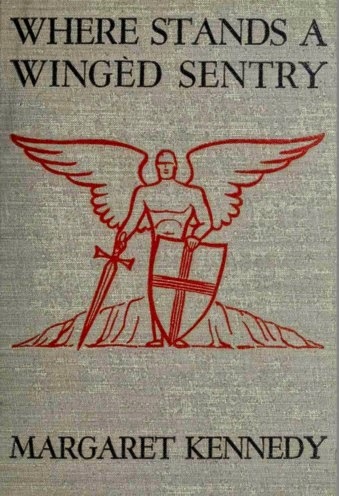 Where Stands A Wingéd Sentry is Kennedy's account of life in England from May to September 1940. The book was written up from her diaries of the time, for an American audience. She changed the names of people & places & acknowledges that much has changed even in the short period between the summer of 1940 & 1941 when the book was published. I found it to be an incredibly honest account of the emotions & fears of one woman & her family in a period when a German invasion seemed imminent & inevitable. It reminded me of the comforts of hindsight & of what I really value in the fiction & memoirs I've read of this period. The knowledge that we have, that Germany would not invade & that although there would be hardship, destruction & death, Britain would survive, was not available to Margaret Kennedy. No matter how much research a modern novelist does into the period, they can never create the atmosphere & the immediacy of a first-hand account like this one. In 1940, Margaret Kennedy was living in Surrey with her three children, a friend's daughter, her mother-in-law & her children's Nanny. Her husband, David, was a barrister in London, coming down for evenings & weekends. The invasion of France seems unbelievable at first, even after the German invasions of Norway, Holland, Denmark & Belgium. However, the reality soon hits home with air raid drills & road blocks being placed along the coast roads in preparation for Hitler's inevitable invasion of England. Cotter says they are hastily putting up log barricades on all the roads and taking down the signposts, and the farmers have orders to put obstructions in large fields where troop-carrying planes might be landed. The British Legion has been told to guard the local telephone exchange. There are notices in the village telling us what to do if we see parachute troops coming down. We are to lock up all cars and bicycles at night and if we leave a car unattended it must pretty well be disembowelled. Apparently it won't do to just take out the ignition key because the Germans know about hairpins. Kennedy & her husband decide that she & the children should move to Porthmerryn, a Welsh coastal village where Kennedy lived as a child. David will stay in London to work & also because he's an air raid warden & his mother will return with him. Nanny & the children go on ahead while Margaret closes up the Surrey house. As the children set off for Porthmerryn, they see trainloads of soldiers returning from the evacuation at Dunkirk. Friends come down to say goodbye & Margaret is reminded of the Munich crisis. The same feelings of unreality & the same conversations with friends canvassing all the many possibilities. Porthmerryn is a village of three communities. Downalong, where the fisherman & local people live; Upalong, full of retired middle class professionals who've bought houses there to take advantage of the fishing & the golf; & the Artists, who live between the two communities. The Artists arrived in the 1890s to paint the coast & the seagulls & more artists come every year to live cheaply & soak up the atmosphere. Kennedy is surprised that Porthmerryn has not changed at all since she was last there. The war doesn't seem to have touched it at all except that all the fishing boats went off to Dunkirk & haven't yet returned. even that didn't matter much because it's not the fishing season so they weren't needed. There's still plenty to eat, the blackout is very sketchily enforced & the weekenders come down for their holidays as usual. People who went to the East coast for their holiday last year have come to Wales this year. The Kennedys consider sending the children overseas but worry about the dangers of the voyage. They're also uncomfortable about the inequality of the schemes on offer. Middle class children will have advantages that working class children would never be offered & eventually they decide that the children will not go. In July, the first air raid warning causes considerable panic but, apart from the harbour, there seem to be no obvious targets in the area. Nevertheless everyone goes through their drills & the children take it all in their stride, incorporating air raids into their games & dropping to the ground just as they've been taught when a loud bang goes off unexpectedly. Margaret's reaction to the raids is not so much fear as anger with a rueful realisation that she's essentially helpless to change her circumstances. After luncheon I climbed along the cliffs to Spaniard's Point and sat on the end of it and contemplated the sea. Suddenly a huge plane shot down out of the sky. I don't know where it cam from, but as it roared over Spaniard's Point I could see the black crosses on it. And I picked up a small stone and flung it at the plane. At least I meant to fling it at the plane, but it went in the opposite direction, as things always do when I throw them. Everybody loves the R.A.F. Today i saw a young pilot walking down Fore Street - one of those pink, stodgy-looking boys who are working these miracles ... People turned to look after him, as they passed, with a kind of worship in their eyes. The shop people came to their doors, and all the way up the hill people turned round to stare. We did not cheer. There was a feeling in the air which went far beyond cheering. Then there's her description of the influx of those she calls the Gluebottoms, people who have left the cities for the safety of the country but expect all the facilities they had at home. She's most annoyed at the number of able-bodied young women who seem to have no thought of joining the services. I look at the Gluebottoms, sitting on the sands until it is safe for them to go back to their comfortable lives. It's well for them that the shelterers (those who have been left homeless from raids) are not all Communists and that there is such a strong feeling in this country for tolerance and common sense. England after the war is going to belong to the shelterers. And it won't be the England Bob (a Communist friend) wants, or the Gluebottoms' England either. It will be a land fir for human beings. Meanwhile, Margaret worries about David, living in London & spending his nights as an air raid warden. His experiences give a different perspective to the family's life on the coast. One of the wardens, bombed out of his sleeping place, pulled himself from the wreckage and walked along the street to get to a friend's house to ask if he could sleep there the rest of the night. In the blackout he walked into a rope stretched between two houses to stop people going up that street because the houses were unsafe. He fell over the rope and both the houses fell down. In the warden's log the entry just says, "At 3.30 A.M. Mr Gamble collided with two houses and demolished them." Margaret is often worried about the morality or otherwise of the decisions she & David make - about the children, about where they live & the contribution they can make to the war effort. She knows how lucky she is & spends a lot of time praying for the country as well as for her family's safety, while also realising that Germans & Italians are praying the same prayers to the same God & wondering how to reconcile that. Early in the book, she attends a service for the National Day of Prayer & remembers singing the same hymn, O God our help in ages past, at the memorial service for her brother, killed in Palestine in 1918, then again, only a few months later, at the Armistice. At the end of the summer of 1940, the invasion scare seems to have died away and, although the bombing raids continue, the weather will deter any plans of invasion until the following year. The leaves are beginning to turn and today I have rinsed through and dried our bathing dresses and put them away till next year. The summer is over. I was just going to write that I wouldn't have missed it for anything. But when I think how lucky we have been so far, and what others have had to suffer, I feel I have no right to say that. Some great sorrow may come to this family still. I may then earn my right to say it. But we have certainly taken life to pieces and found out what it is made of. We have come a long, long way since we all went to church on the National Day of Prayer. I read about Where Stands A Wingéd Sentry from the extensive list of books on WWII by women on Scott's blog, Furrowed Middlebrow, & I was able to borrow a PDF copy of the book from Open Library. The title is a quotation from a poem by Henry Vaughan which I posted in Sunday Poetry last weekend.